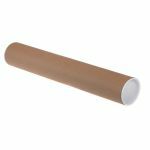 Ideal for A2-sized prints, like posters, artwork and calendars, our cardboard postal tubes provide the perfect economical and lightweight shipping solution for documents sized up to 594x420mm (23.4x16.5 inches) which can be rolled. Our postal tubes give your documents a professional look while keeping them safe and secure. Made from strong and durable recycled and recyclable cardboard, the tube packaging is completed by two tightly fitting white plastic end caps, which help protect the contents from dust and moisture. Our cardboard postal tubes will keep important documents dry and clean whether in transit or storage. * There is currently a lead time of 2-3 days on these postal tubes. Whether you need to store or post important documents or posters, you’ll find our postal tube range has the answer. The A2 size cardboard tubes are an efficient and economical way to package items such as plans, blueprints, maps, artwork, prints, calendars, posters and other papers, which can be rolled. Our tube packaging is environmentally friendly, being made from recycled material and recyclable as well. It is strong and long-lasting so can be used over again. Added protection comes in the form of white plastic ends that securely hold the contents of the mailing tube in place, protecting from dust and dirt. The ends are specifically designed to fit snuggly in the cardboard tubes but can also be taped for added security. Quick and easy to use, so saving you a lot of packing time, our economical postal tubes provide all-round protection and deliver their contents safely to their destination.